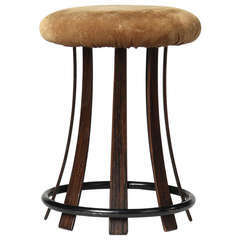 An ash stool with sheepskin cover seat. Designed by Edward Wormley for Dunbar. A beautifully restored pair of Dunbar Thebes stools designed by Edward Wormley. An excellent and architectural stool with a series of vertical ebonized ash slats held by a single ring footrest and disappearing into the seat. Mahogany frame stool by Edward Wormley for Dunbar, refinshed and reupholstered. Sculptural X base stool or Ottoman, designed by Edward Wormley for Dunbar, circa 1950s. 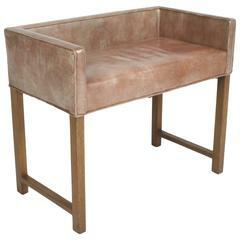 It has been refinished in an ultra-deep brown lacquer with a velvety blue upholstery. 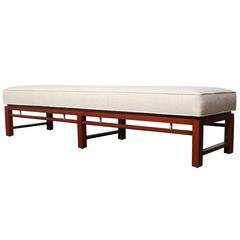 Bench by Edward Wormley for Dunbar. Ebonized mahogany frame with brass details. Newly upholstered.